﻿﻿﻿Please note that payment plans are available to suit. Cassie is 58 cm (23 inches) long. The collar that Cassie wears is what I believe to be Irish crocheted lace. The tea pot was painted by an artist unknown to me but the work is beautifully painted. The dress is hand dyed. Fabian is 49 cm (19 inches) long. *Old vintage basket (please note very damaged lid). Please note that this was in my collection as one of my favourite gollies. Marion is 52 cm (20.5 inches) long. Little Sarah is 20 cm (8.25 inches) long. *They are both made of quality mohair. Marion wears a gorgeous old dress. The fascinator is made of velvet petals, sequined flower, and it holds one of my favourite metal antique buttons in the middle. Vintage netting is worn on the fascinator, the shawl, and the waist. Marion has a beautiful fine petit-point antique purse for the longest time. 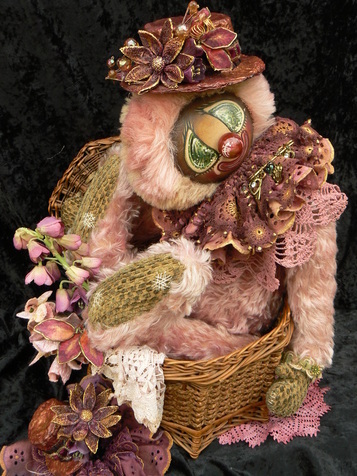 They both sit on an old leather suitcase accompanied by old cotton reels, decorative flowers and doilies. A very special scene to behold indeed! Monet is 33 cm (13 inches) long. Bear is 15 cm (6 inches) long. Rabbit is 20 cm (8 inches) long. *A very special scene indeed! Kimmy J is 39 cm (15 inches) long. Lily is 16.5 cm (6.5 inches) long. The Jester Stick Panda is 18 cm (7 inches) long. *The Pandas are made of alpaca and mohair. 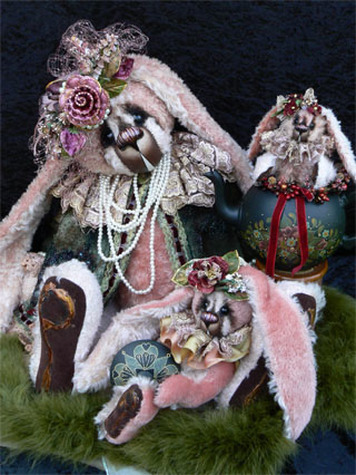 *The Panda Jester is made of clay. All characters wear vintage netting and come with a lovely recycled perfume bottle. *All characters are completely hand stitched. *All details are hand painted. *All the lace on the jacket is hand stitched. *Countless loving hours alone have gone into creating the jacket. *The bear has glass eyes. *Muzzle and nose are made in Marnie's unique typical style. Molly Golly and her Jester have been completely hand stitched. Made of alpaca and mohair. Hand painted details in unique Marnie style. Centre of the fascinator and brooches are made of lace bobbles hand painted, sewn and beaded. Larger rabbit = 58cm long approx. Smaller rabbit = 31cm long approx. 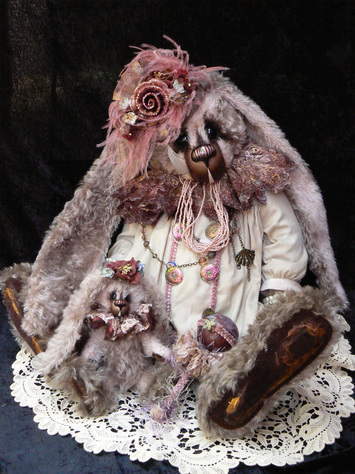 Completely hand stitched mother and baby mohair rabbits. Dacron and glass pellet filled. The muzzle and nose are made in Marnie's unique typical style. Adorned with beautiful head pieces, lace, and vintage netting. Medium rabbit = 31cm long. Miniature rabbit = 22cm long. Large rabbit = 58cm long. All three rabbits are completely hand stitched in pale peachy pink mohair. 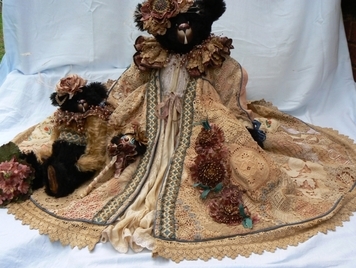 Mother rabbit wears an exquisite cardigan that is hand beaded by the artist (many hours went into this. A labour of love!). They all wear beautiful head pieces, old-style lace collars. 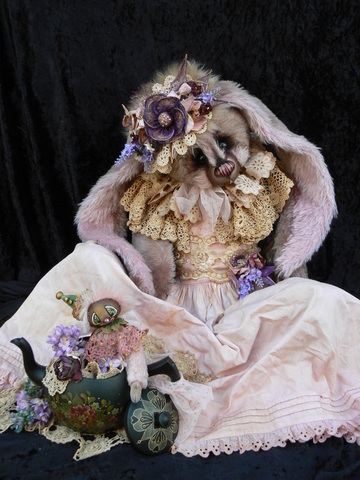 Baby rabbit sits in a highly detailed hand painted teapot. 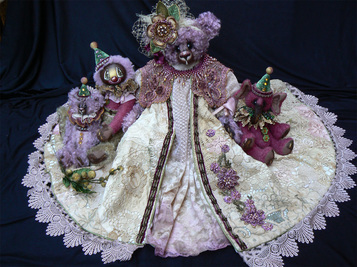 The two larger rabbits are wobble jointed. Large bear = 70cm long. Little bear = 23.5cm long. 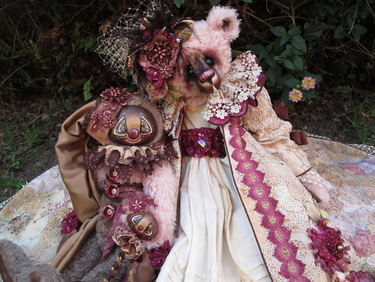 Mother and baby are both completely hand-stitched pink mohair bears. Original one-off Marnie Pantano design. 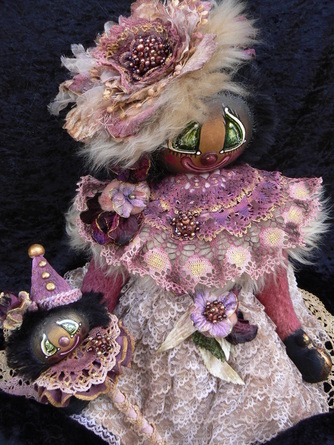 All characters are completely hand-stitched and made from mohair. 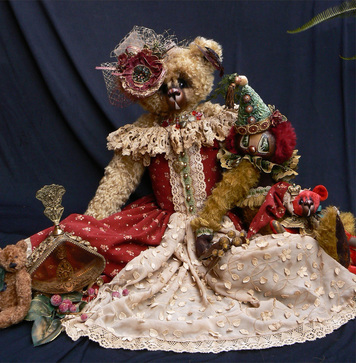 The glass buttons on the Rabbit's dress are from Czechoslovakia. Please note that the doiley is no longer available. 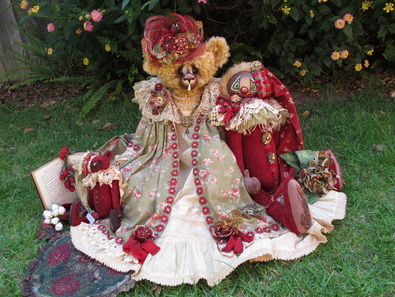 The Large Bear and the Golly are completely hand-stitched from mohair. 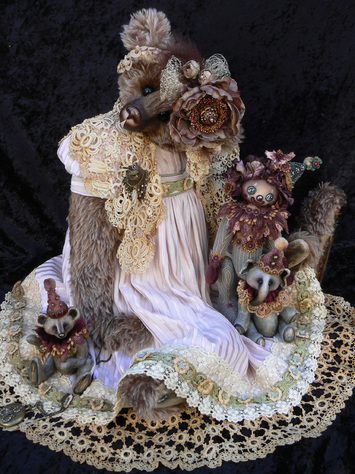 The little brown toy bear is a Sonya Heron piece. The dress is completely hand-stitched by Marnie, as is the clay hat on the Golly. Please note that the perfume bottle is no longer available, although it could be replaced (at extra cost) by a similar one if required. 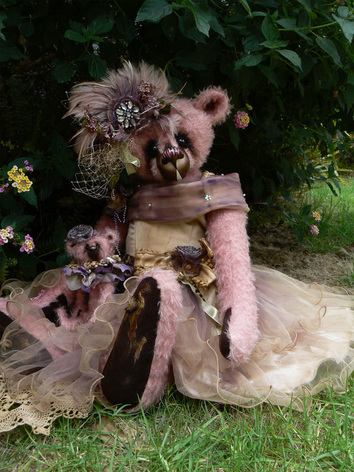 The ruffle around the neck of the Large Bear is made from a beautiful rustic upholstery fabric and is embellished with a high-quality ornate trim that Marnie has hand-beaded. The Clown's hat is made from a quirky tin funnel that Marnie has painted and trimmed. 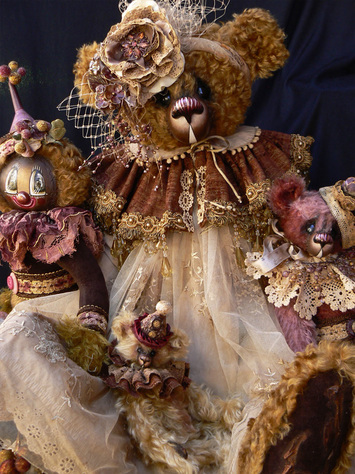 Both the Medium Bear and the Golly have been accessorised with high-quality trims that have been hand-painted. The muzzle and nose are made in Marnie's unique typical style. Completely jointed. The lace on the dress is completely hand-stitched and painted by Marnie. The piped jacket was put together by a professional wedding dress maker. All the accessories are made and painted by Marnie. Large bear = 65cm long. Medium bear = 33cm long. Golly jester excluding hat = 22cm long. The muzzles and noses are made in Marnie's unique typical style. All the details are hand-painted and antiquated to give the old look. All the lace on the jacket is hand-stitched. Endless hours have gone into the jacket alone. 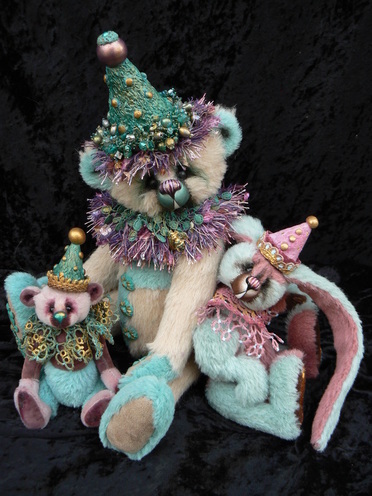 Both bears have been accessorised with high quality trims. *All characters are completely jointed. 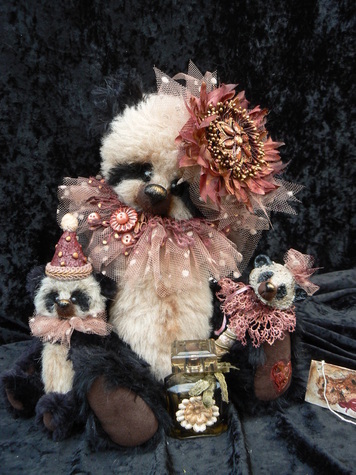 *The bear and golly's hair is made from high quality mohair. 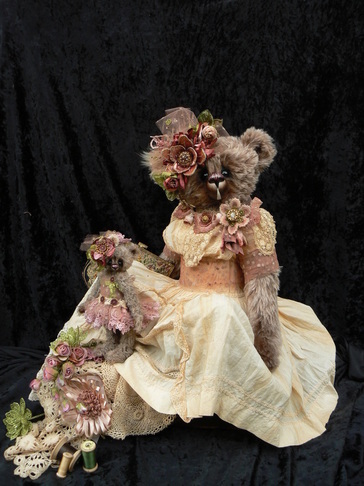 *The bear is wearing a stunning vintage dress and lovely petit point brooch. 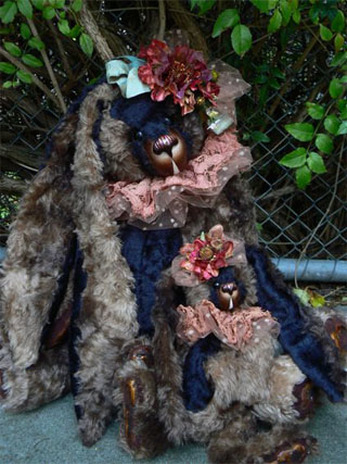 *Golly body and bear made of lovely woven upholstery fabric.